Maintaining good health is important, and maintaining good health records plays a key role in doing so. Recently, Toronto Public Health has increased monitoring of students who are either missing a vaccination or did not file the appropriate record proving vaccinations are up to date. Schools, both public and private, do not allow unvaccinated children to register or attend for public health and safety reasons. Either of these infractions, a missed or unreported vaccination, will cost your child a suspension from school until the matter is resolved. Maintaining good health is important, and maintaining good health records plays a key role in doing so. Recently, Toronto Public Health has increased monitoring of students who are either missing a vaccination or did not file the appropriate record proving vaccinations are up to date. Schools, both public and private, do not allow unvaccinated children to register or attend for public health and safety reasons. Either of these infractions, a missed or unreported vaccination, will cost your child a suspension from school until the matter is resolved. In fact, according to a recent article in The Toronto Star “A total of 5,063 public elementary students were suspended in Toronto this school year after getting caught in what one doctor called, a “1970s-style, cumbersome process” over immunization records.” Unfortunately, the article states, there is no system in place for doctors to remind parents about their child’s immunization, and no system for parents to keep updated about it. This widespread problem, resulting in a whopping 7% suspension rate of elementary students alone, needs to be addressed by a reliable digital reporting system that keeps track of all vaccinations as they occur. The onus is on the parents to report the vaccines, but having the information at your fingertips could save a lot of frustration, stress and missed school. Enter HomeMD, a patient-centered health care service that starts with the simple download of an app. This app opens up the world of healthcare and records maintenance and essentially brings it to your door, or device. Since your child’s school requires an updated immunization card, with HomeMD, you will never worry again about school suspensions or missed vaccinations. The HomeMD digital immunization record will effectively eliminate missed or unreported vaccines by ensuring all information is available to you 24/7, via our app. HomeMD is one of the only family practices in Canada that grants you secure access to your medical records via an iOS app. You will have complete access to your diagnostics, health history, immunizations, medications and encounter notes. This allows patients to take control of their health and work in tandem with the primary care professionals at HomeMD to maintain optimum health. Join our family practice for $20 per month, and you will receive unlimited access to all two platforms available – office visits and telemedicine – video consultations. HomeMD doesn’t just use technology to deliver convenient live expert medical advice; it provides the tools necessary for peace of mind through other innovative technologies. HomeMD clients have access to all of their health data in real time—from immunization records, medication history and encounter notes to referrals and lab results. Giving patients access to their records is useful because it not only allows, but encourages the patient to be proactive about their own health and, importantly, to have the opportunity to keep track of and report vaccinations. Most people don’t avoid vaccinations, they simply lose track of the yellow immunization card. HomeMD’ s digital version of the yellow immunization card will rectify this problem and allow children and adults alike to stay up to date with their vaccines and to report them accordingly to avoid school suspensions. Just as live medical advice is always a swipe away; HomeMD’s unique app is easy to navigate and makes access to digital records simple and secure, including immunization records. Stay up to date and on top of your medical care with our integrated electronic medical records. With a simple download of the app, you will be accessing several platforms and can choose the one that suits your current healthcare needs best. Welcome to the next evolution of family medicine in Canada. 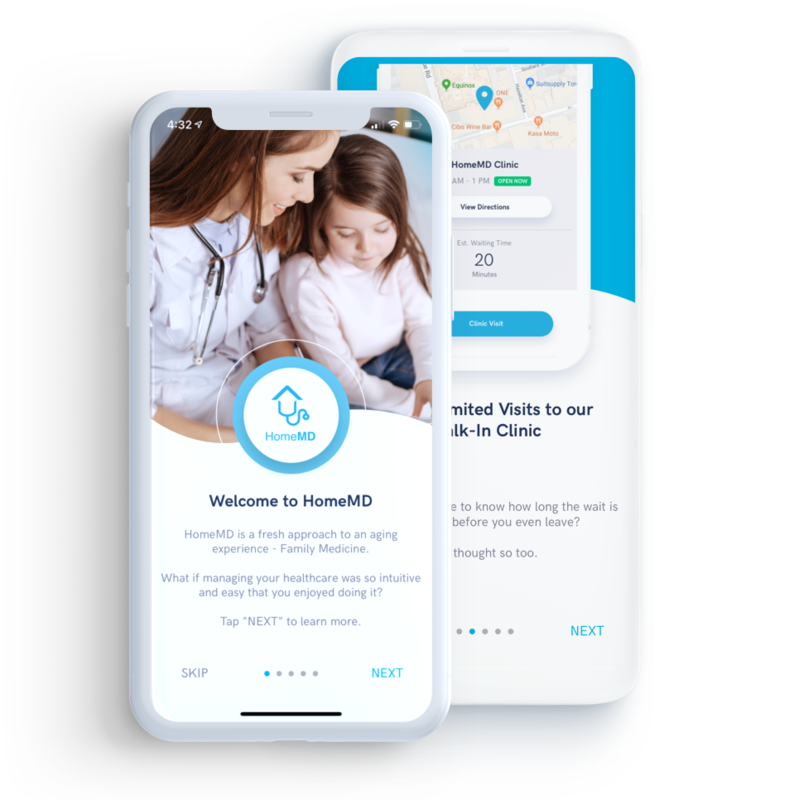 Now serving the mid-town and downtown Toronto area, HomeMD features a powerful new app offering a unique platform designed to make your life easier and healthier. The new software is the next step in patient-centered care. It reflects our goal to design our family practice around you, our patient, and to provide the treatment you need, when and how you need it. Added features include secure access to your personal electronic medical record as well as the Yellow Immunization Card in Digital Format, to prevent loss, missed immunizations or double immunizations. Secure digital access to all your medical records;Unlimited visits to our state of the art medical clinic conveniently located in mid-town Toronto;Yellow Immunization Card in Digital Format for your family;Unlimited Video Consultations with our Medical Professionals.